This perennial wildflower is 1-2' tall, sending up one or more light green, hairy, stems from the base that are unbranched or sparingly branched. Alternate compound leaves are widely spreading; they are odd-pinnate with 9-25 leaflets. Individual leaflets are up to 1" long and ¼" across. 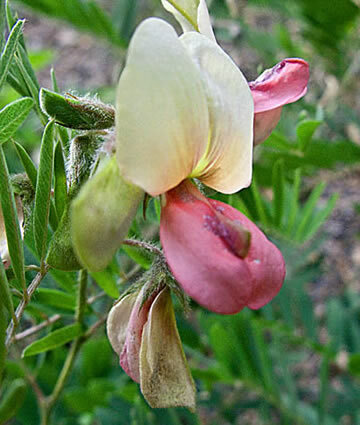 Upper surfaces of the leaflets are hairless to silky-hairy, while their lower surfaces are pubescent to silky-hairy. Each leaflet has a prominent central vein. The stems terminate in short dense racemes about 2-3" long that are covered in buds and bicolored flowers facing all directions. The racemes are held a little above the foliage on short peduncles. Individual flowers are ¾" long and across, consisting of 5 petals, a short tubular calyx with 5 teeth, 10 stamens, and a pistil. 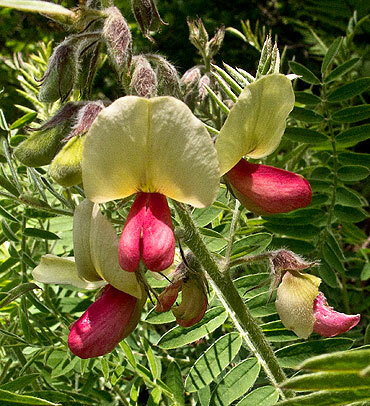 Each flower has a typical pea-like floral structure, consisting of an upright banner and a pair of lateral wings that project forward to enclose the keel. The broad banner is white to pale greenish yellow, while the wings are deep rosy pink. 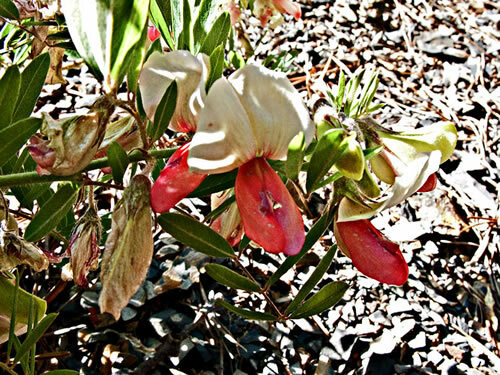 The blooming period occurs from early to mid-summer and lasts about 3 weeks.